That would be the perfect way to describe Olivier Rousteing's Pre-Fall 2013 Balmain collection. Now, of course I am more than a bit biased on the matter, especially considering that my love affair with Balmain (my very own brand of Balmainia) began in Christophe Decarnin's glorious days at the celebrated French fashion house. So, instead, let me give you what I like to call this collection's fashion specs - that is, the essential characteristics that any fashionable young person ought to be swayed by . Firstly, the inspiration. The legendary columnist and editor, Diana Vreeland once said, "Extravagance is my only reality." Vreeland herself is the inspiration behind this collection, and the extravagance of this collection is very, very real. And it's all in the details, darling. If it isn't the sparkle and shine of the ever-present gold and metallic embellishments, it's the Oriental screen-like mosaiced brown leather minidresses, the jewel tones, and the bamboo print and faux tortoiseshell (love!) - decorative touches evocative of Vreeland's office and other spaces. Lastly, the dream. 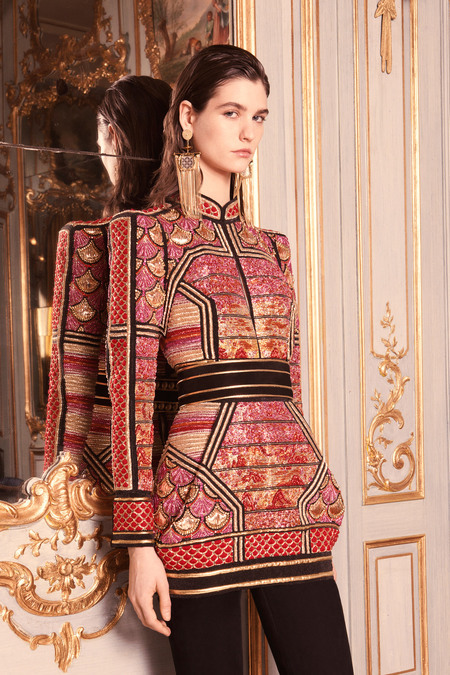 Of course the fact that Balmain is infamously expensive means that most of us can only literally but dream of owning a piece of any collection. However, even for its customers, it is Rousteing perfect mix of cultures, and just right elaborate statement with this collection, that one can only dream of that is alluring. Who wouldn't want to own a piece of this dream? A lot of times it's difficult to get that "perfect balance" between user friendliness and appearance. I must say you have done a amazing job with this. Additionally, the blog loads extremely fast for me on Internet explorer. Outstanding Blog! Hi there, all is going nicely here and ofcourse every one is sharing data, that's in fact good, keep up writing.